A brutal dust storm swallowed Mars last summer. The storm from the whole planet spared the Curiosity nuclear engine, but the older Opportunity solar engine closed because the thick dust blocked the light from the Sun. 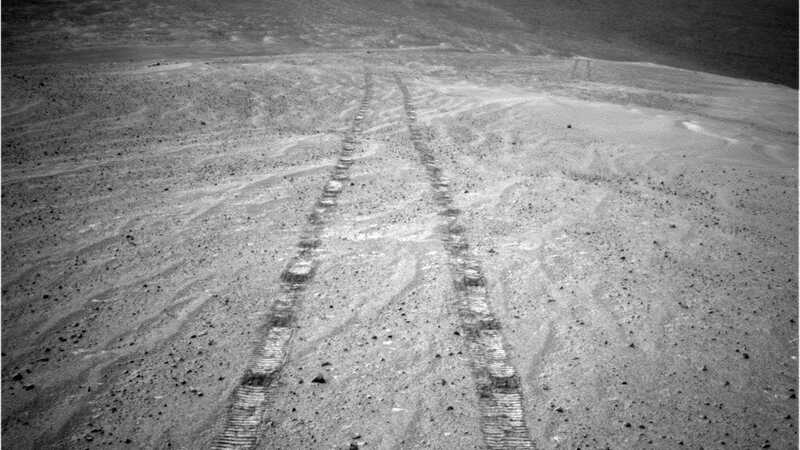 Opportunity is silent June 10, 2018, despite NASA's hundreds of attempts to connect to it. When the windy season on Mars began in November, scientists hoped that gusts could clear the debris from its solar panels, but that hope seemed to be in vain. NASA continues to send commands for recovery, but unfortunately it seems that the Opportunity mission is finally over. At the same time, 2019 is a historic moment for the Rover, which officially reached its 15th year on Mars on January 25. This far exceeds the initial expected lifetime of the 90-day Rover. Together with Spirit's Mars, which ended in 2010, the Mars Exploration Rover (MER) marks one of the most important scientific programs of the modern era, finding evidence that Mars was once liquid-coated and sent back icons on the surface of the planet. I have not given up yet. We have a list of things to test and we have not done until we try everything. But we get to the bottom of the list, so it's a good time to start thinking about these things. As far as he feels, he actually feels good … It's a decent death. [The rovers] are not immortal. You know that sooner or later you will lose them. To have a 90-day mission for 15 years, and then end one of the most fierce dust storms to hit Mars for a very long time, we can go with high heads. The mission surpassed much more than what I could expect. Heritage is difficult … Heritage is both a legacy of both Sprit and Opportunity, and the spirit and heritage of the team that built them first. a team of engineers, scientists, managers, leaders and financial people. The reason to be so successful is because of what they did 15 years ago. This is where the credit belongs. From the scientific heritage, Mars was a much more interesting place than I expected. This changed the way people look at Mars. The three sites that preceded ours were on these flat, infertile plains – deliberately – because they were the safest landing places. This is the whole land we have seen. It made me excited to do my job. We have these small picturesque rovers that climbed the mountains and dropped into craters. Mars has become a true scenic, beautiful, interesting place in the sense that you can imagine that you are there, and you are walking along the Rivers' slopes and seeing what they have seen. This changes our perspective. The third part of the legacy is the effect these missions have on children. One of my favorite dreams, and I know this probably happened, is an 8-year-old who watches TV in 2004 when we landed and thought, "Wow, I think it's cool but I can do better, "I see evidence that the mission has done this to a certain extent, inspiring young people to pursue their career in science, engineering and technology with their own dreams. The Mosaic Sefifies shows the dust-free solar panels of Opportunity in December 2004. Everyone talks about the incredible engineering that allows us to drive a robot to another planet without a mechanic in absurd conditions for 15 years. This is an amazing achievement. But for me and for the team, there are all these 15 years. There were people on Earth who were involved in scientific and engineering teams gathering three to five times a week to cope with the progress of the day before, and carefully program what they could do the next day. For this team this is more than a robot and we will miss it …. It was a lot of fun to work on, we are happy that it was so successful. And this level of dust is definitely an honorable death if we do not hear it again. I hope the Opportunity is back online! I was back in school at MER (2003-2009), which is proof of the duration of the mission – 15 years is about three consecutive PhD students! The opportunity has made great science until it has lost contact, and exploring new rock units that it should never have been able to reach through its initial design parameters. Both the Spirit and the Opportunity have fully revolutionized the way we deal with Mars science, and it is safe to say that we will not have Curiosity without the great success of the MER mission. Spirit and opportunities * shaped * paved the way for the curiosity and the future rovers in the solar system through their innovative technical and scientific achievements. Opportunity surpasses all the expectations we could have for it. She unlocked the mystery of the hematite signal found by the orbits in front of her, learned about the watery and windy past conditions on Mars, and drove farther than any other rover outside Earth. Regardless of what the Red Planet seemed to throw on it, she and her clever team of engineers managed to find a way to get around it – to the last global dust storm. But it is appropriate that something that finally got Oppy out is the strongest dust storm we've ever seen on Mars. Now she can rest, knowing she is proud of humanity as our little robot-emissary. I during the development of Rover's Curiosity because it showed how the virtual geologist can really bring the story of an ancient environment, learning the record held in the rocks. Ancient water flowed over the surface, playgrounds between dunes, underground waters, soaked rocks, such good things … all this kept me in the hardest days to gain curiosity about Mars. Images like this, which show that the formations are probably created with a flowing fluid, have provided scientists with evidence of the wet past on Mars. Spirit and Opportunity Really Bo public announcements for an active science mission when Steve Squyres and Jim Bell made the choice to make all images available to the public when they arrive on Earth. They wanted to make sure that students could work with the data and that they did not need to be on a password-protected server … Jim and Steve said, "No, we want the public to enjoy the adventure in the same way. That is right. It created this huge international community of people who were able to follow the daily dream of exploring another planet through the eyes of Spirit and Opportunity. People would do mosaics and animations, discuss the rocks they've seen, and what the science team does. In many cases, people in Europe will see the images before the American team wakes up – Squyres as a check on these forums because it's easier than to deal with [the server]. way. NASA's JPL, having seen the mission of Mars Exploration Rover, said well, we would also share Cassini's images. Many other missions were following their steps – all of Mars missions such as Curiosity, Phoenix and InSight. This has influenced the European Space Agency to be more open with its image data – its structure is different from NASA's structure as institutions build and supply cameras but they are able to start sharing a camera called VMC that shared images [from Mars]] as soon as they hit Earth, and Rosetta shared their images from NavCam pretty quickly. Juno and New Horizons share their data quite quickly … It has had a great impact on the way missions share their data with the public. I think it's interesting that when Opportunity first paused, many people were ready to save it immediately. Maybe this is a more pragmatic thing, but it does not take into account the feeling of the people who have been holding this spacecraft alive for so long. I think it is necessary for the team to exhaust every opportunity so they can feel a certain closure of the mission. Some of them are sure I do not want to give up … Big emotional investments are needed to support these missions. I suppose I hope Opportunity surprises us and returns. I suppose it probably will not be, and I'm sorry for the engineers for their loss. People will have to take the time to mourn and realize it's emotionally difficult. I'll miss out on regular interaction with the team. These people have been working on this mission for a very long time, and although people have left, and others have come, there is a really wonderful feeling of friendship. I can recognize everyone in their voice. I know we can rely on people when we face challenges or difficult scientific issues. It's really fun to work through all these issues with the people involved. I will also miss to wake up every morning and see what the rover has sent, what are the most recent pictures. Every day you see something that no one has seen before. I have a very personal story with Rover. I was in high school when Spirit and opportunity landed. There was a program run by the Planetary Society, called the Student Astronaut Program, which led the students to JPL to be there the night the river landed. I was there the night the Opportunity landed, and it was an incredible experience that inspired me to go to planetary science. The way the Spirit and the Opportunity transformed the science of Mars was quite profound … He gave us a new perspective on the planet we did not have in 2000. there was no definitive evidence that there had ever been any liquid Mars in the past. These were the first images from Oppy and later from Spirit, which were undisputed evidence that Mars had a different climate that could keep the liquid water on the surface. It has opened a whole new set of questions that we can ask about the evolution of Mars. These questions were answered by Rover's Curiosity, a larger new rover with more sophisticated tools, and some of them will be replied to the returns; some will need future missions to answer. We did not even know what questions to ask before we received the results of Spirit and Opportunity. I'm just excited that it lasted as long as it was.